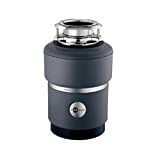 InSinkErator Badger 5 (1/2 HP) Food Waste Disposer is one of the best garbage disposal available on the market. It is easy to install and durable due to the motor’s lack of wearable parts. The disposer is manufactured in USA. There are so many certified and professional service techs available to ensure that they can provide an excellent after-sales service “We Come to You” warranty. Using a garbage disposal in your kitchen is not only a practical and convenient way to dispose of food waste, it also allows environmentally-conscious consumers a viable way to proactively reduce the amount of leftovers that wind up in the nation’s landfills each and every day. 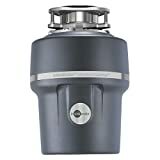 When it comes to choosing a garbage disposal system for your own kitchen, the InSinkErator Badger 5, ½ HP Food Waste Disposer is one of the best garbage disposals you should consider. • ½ HP Dura-Drive induction motor is manufactured in the USA with no wearable parts. • Grind chamber: 26 oz. The Badger 5 is proudly manufactured and assembled in the USA by InSinkErator, located in Racine WI. 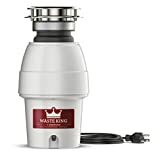 The company has not only been the leader in providing the best quality food waste disposers for home and commercial use in the world, they are also recognized as having invented the first ever food waste disposer in 1927. 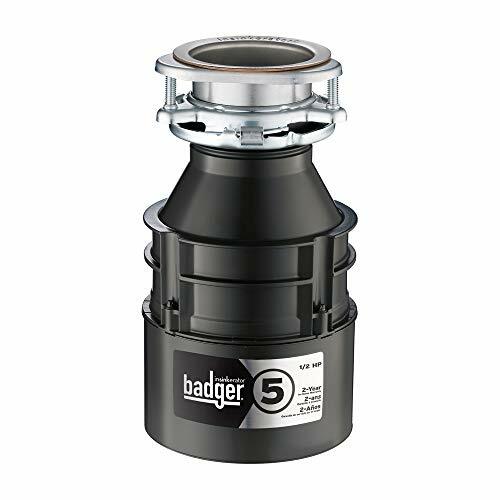 When it comes to choosing a food waste disposer you have only to compare the Badger 5 with its competitors in the areas of reliability, size, affordability and maintenance free operation. With it’s compact size and powerful ½ HP Dura-Drive motor the affordable price tag makes the Badger 5 a clear winner in terms of value and benefits for consumers looking for a garbage waste disposal system in the home. One of the added features for those home that already have an existing InSinkErator Badger waste disposal is the Quick Lock installation system. This allows homeowners wishing to upgrade or replace their current InSinkErator to only have to twist off the old system and twist on the new one. For those installing a Badger 5 for the first time the stainless steel flange and 3-bolt mounting assembly matches up with most stainless steel sinks, allowing for quick and easy installation. This is one of the most often mentioned features of the InSinkErator Badger 5, ½ HP Garbage Disposal. The exclusive “We Come to You” full-service, limited warranty provides consumers with in-home access and free house calls (parts and labor) to over 1,500 service professionals, certified and trained in all facets of installation, repair and maintenance. When running your Badger 5 garbage disposal, it is advisable to start with a slow stream of cold water prior to turning on the system. This aids in solidifying food waste, making it easier to be flushed through the pipes. Once the disposal is running slowly, add scraps of food. Do not overload. After the grinding is finished, allow cold water to continue to run for an additional 10 seconds or more. 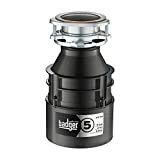 An extensive analysis of published customer reviews indicates both the performance and value consumers have found in their use of the InSinkErator Badger 5, ½ HP Garbage Disposal. 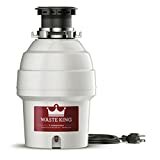 The key feature that consumers really like about this garbage disposal is the ease of replacing one InSinkErator disposal with another due to the twist off, twist on mechanism of the Quick Lock installation feature. Consumers who typically hesitated to switch out disposals on their own were pleasantly surprised at the ease with which they were able to easily perform the installation themselves. Second only to ease of installation, the popularity of the “We Come to You” warranty is evident by the numerous mentions found in customer reviews. Consumers are satisfied with the high number and accessibility of certified and professional service techs that are available in their hometowns. Another benefit customers rated as high is the price point of the Badger 5. The cost of the unit is highly affordable for the value received when compared with comparable competitor’s disposal systems. The Badger 5 received high marks due the virtually maintenance free operation of the ½ HP Dura-Drive induction motor due to the motor’s lack of wearable parts. This was cited as contributing to years of reliable and maintenance free operation.